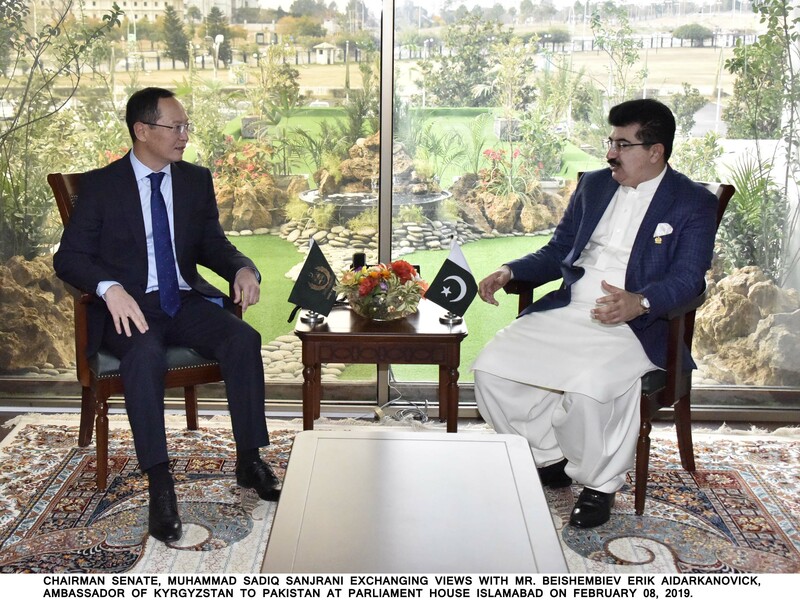 Chairman Senate Muhammad Sadiq Sanjrani has said that Pakistan and Kirgizstan have good relations at parliamentary level and also enjoy cordial bilateral ties, however, economic cooperation needs to be further enhanced for mutual benefit of both the countries. He expressed these view while talking to Ambassador of Kirgizstan Erik Beishembiev, here at Parliament House on Friday. Chairman Senate said that Pakistan and Kirgizstan have shared common ideological and political stances on major international issues and the cooperation between the two sides at parliamentary forums is remarkable. He said that both the countries has historical relations which can be traced back centuries ago as both the nations have long time and close cultural and spiritual ties. The mutual exchange of the visits of the senior leadership of both the countries have also strengthened bilateral relations, however, there is huge potential for trade and economic cooperation. He said that the existing excellent political relations should be transform into growing trade and economic relations. He said both the countries are rich in mineral resources, have high skilled human resources, excellent opportunities for developing industry and agriculture, attracting foreign investments for joint production and supply of goods, including those for export. The Ambassador of Kirgizstan agreed with the views of the Senate Chairman and called for better parliamentary linkages and people to people contact for promoting social and economic ties for mutual benefit of both the countries.